Assessment Centres are not a physical place. They are a method of assessing multiple applicants for a job, consisting of a number of exercises designed to assess the competencies deemed important for success in that job. An assessment day is normally the last stage of the recruitment process. They range from anything from a half day to a full day and will consist of a variety of assessments and activities. Only the candidates who have been short-listed will attend, and so you should expect to be facing other talented candidates. Be mindful that not all of these candidates will be going for the same role. Assessment centres have a proven track record of finding the most suitable candidates for the job. There is normally an itinerary for the day, which can be intense. The employer is looking to see how you handle a busy day under pressure, as this will simulate a busy day in the real job. We recommend getting an early night before your assessment, dress professionally and don’t be late! As experienced assessors, our authors wanted to give you some insight into what they see and what they do as part of an Assessment Centre. In offering you this information, we hope it will blow away some of the myths surrounding Assessment Centres. Analysis presentations are used by employers to test your ability to analyse realistic business scenarios and then formally present your findings and conclusions to your assessors. 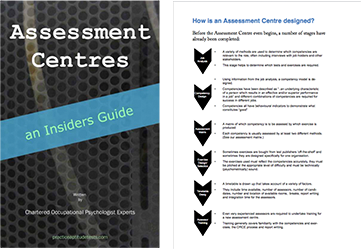 Our assessment centre guide explains what to expect and provides hints and tips from assessors. Group Exercises are designed to simulate realistic meetings or group work situations. They allow recruiting organisations to observe how candidates behave when working as part of a team and are designed to assess a number of core competencies. There are a number of different types of presentation and in our assessment centre guide we focus on presentations you can prepare in advance and deliver on the day of the Assessment Centre.